You are here: Home » Blog » Nipong Naepong – NEW Risotto & Ppong Dishes that will Make Your Tummy & Wallet Happy! Nipong Naepong – NEW Risotto & Ppong Dishes that will Make Your Tummy & Wallet Happy! 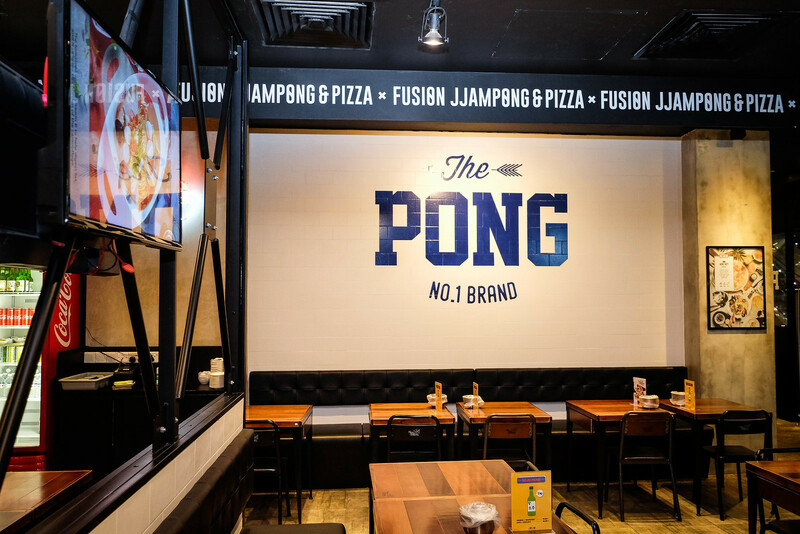 Nipong Naepong, also casually translated as “your ppong my ppong”, is Singapore’s first Jjamppong (“Ppong”) specialty restaurant and a Korean fusion franchise. 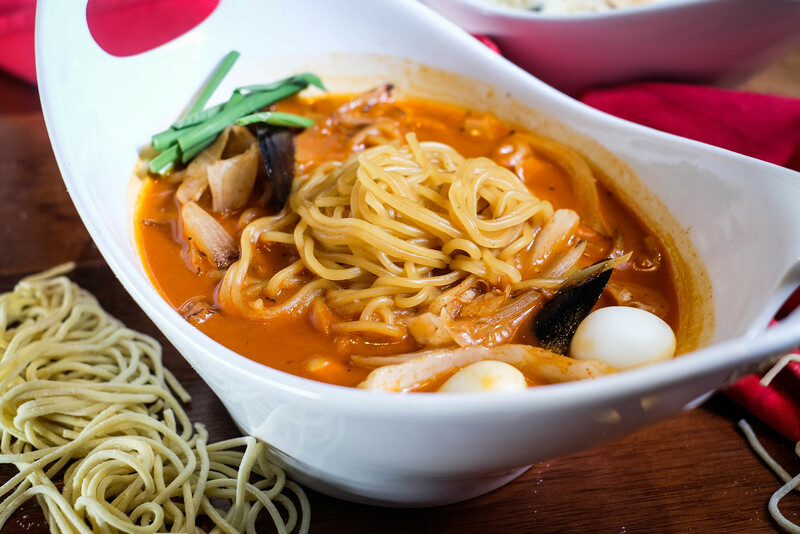 Jjamppong is actually a Korean spicy noodle seafood soup seasoned with Korean chili powder (aka gochugaru). The noodle used is called Jjolmyeon (a type of Korean chewy noodles made from wheat flour and starch). After opening its first outlet at Jem last year, Nipong Naepong opened another outlet at [email protected] shortly after. They have launched 2 new “ppong” dishes as well as 4 new “risotto” dishes. Let’s check them out! Read till the end to find out an exclusive deal for Misstamchiak’s readers! She’s Risotto ($14.80) is an interesting twist on a Singaporean flavour. 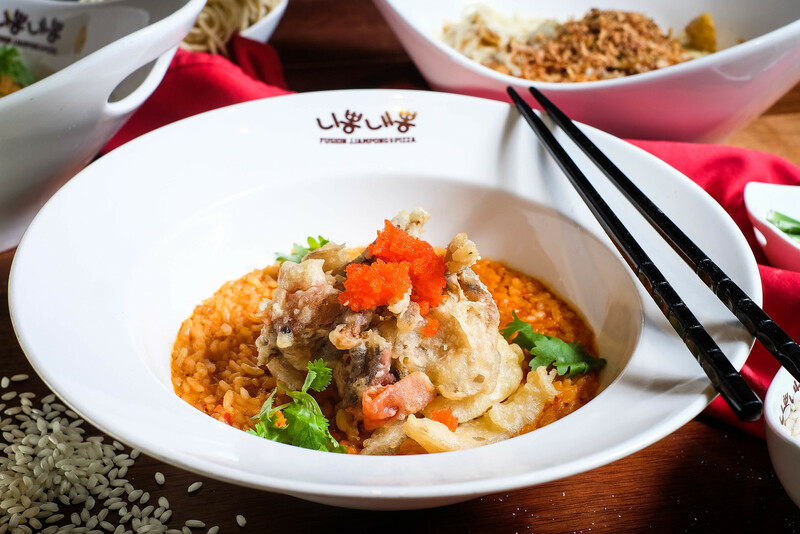 Imagine Italian risotto cooked in Singaporean’s favourite chili crab sauce! Topped with fried tempura soft shell crab and onions, and finally garnished with ebiko roe and coriander, She’s Risotto is perfect for anyone, and everyone. The level of spiciness is definitely manageable so you don’t have to worry even if you’re not good with spice! The light batter of the tempura soft shell crab lent a nice crisp, without overshadowing the natural flavours. Approve! Made with the same Keu cream sauce used in the preparation of Keu Ppong, the Spicy Keu Risotto ($15.80) was my favourite. 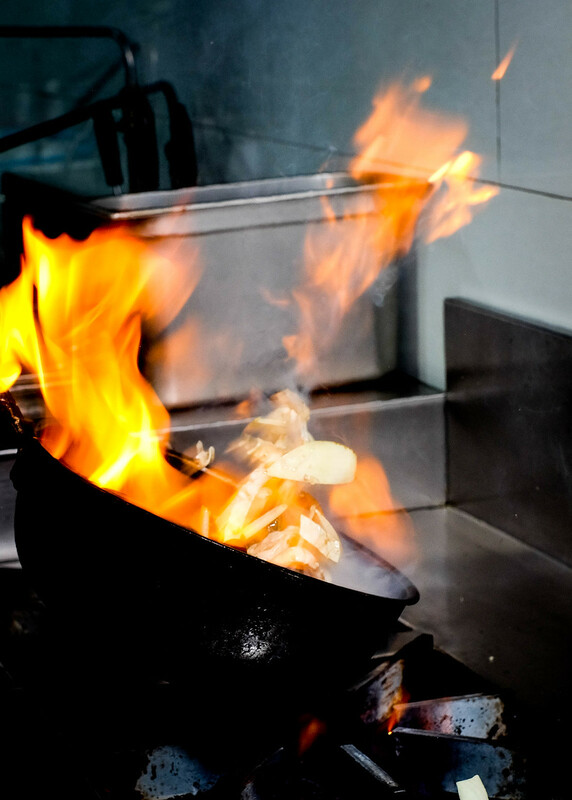 All of the ingredients were wok-fried over high heat together with chili oil, which ensured that the dish is perfumed with a strong and captivating smokiness. 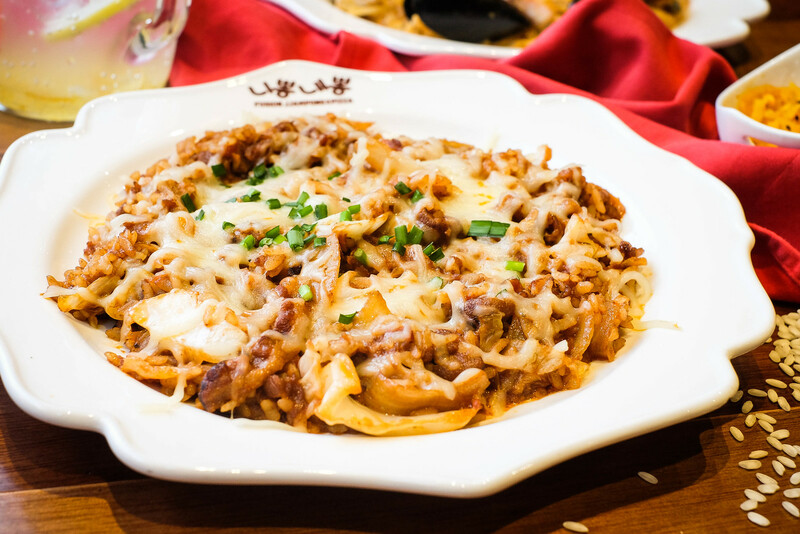 The aromatic dish will definitely win your heart, and don’t be surprised if you find yourself unable to get enough of it! Next up, we have the Po-Tae-To Risotto ($14.80). “Po” refers to pork, “Tae” refers to Thai and “To” refers to Tomato. Did you think that this was a potato risotto? That’s what I thought at first too! But there really is no potato in this dish. You may expect this dish to be quite tangy but it has a very fine balance of sweetness and tanginess. 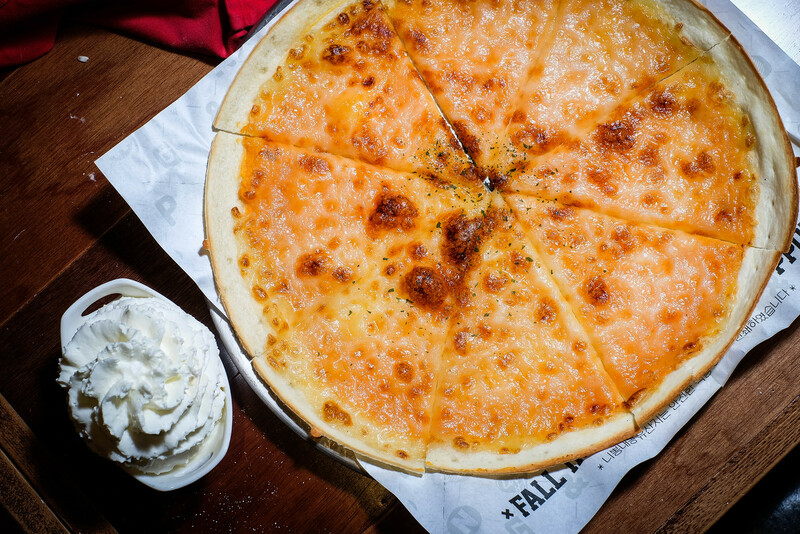 The layer of cheese that binds everything together is just the icing on the cake! A dish suitable for the young and old, the Po-Tae-To Risotto is a palate pleaser. Covered with Japanese bonito flakes and mayonnaise, the Soi Chicken Risotto ($11.80) reminded me of okonomiyaki (japanese savory pancake)! The entire dish is a sticky gooey mess, when given a thorough mix, but I’m not complaining because it sure is an appetizing mess. I’m very sure that both adults and kids will give this a thumbs up! Korean meets Thai at the new Tom Yum Ppong($14.80). Just one glance and we know that the pasta has been cooked to perfection. 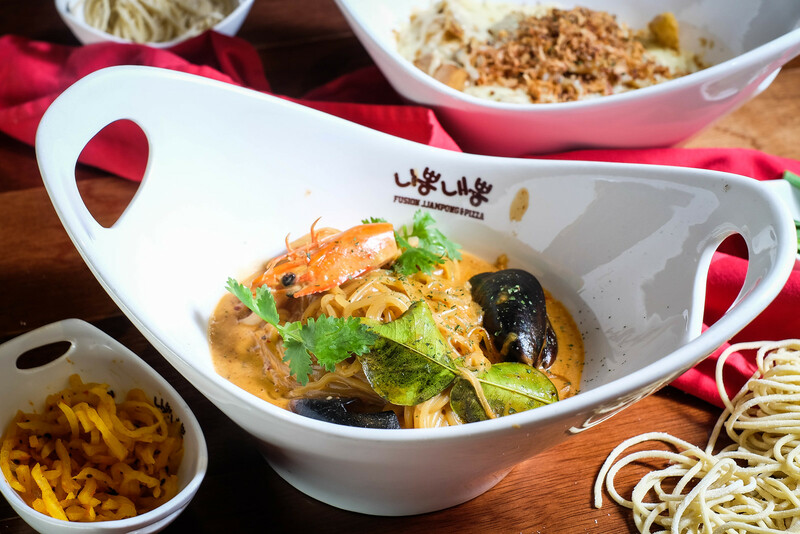 Redolent with fragrant lemongrass and kaffir lime leaf, the paste is coated with glistening tom yum cream sauce! If you’re wondering if this packs a spicy punch like traditional tom yum soups do, I’m here to report that the spice level is more than manageable and it doesn’t leave a burning sensation in your stomach. The chefs have certainly nailed the tom yum cream sauce! 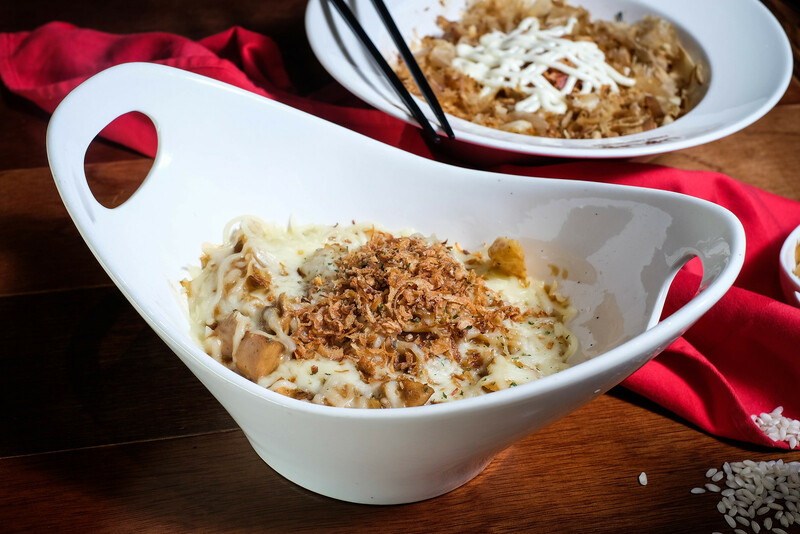 Curry Ppong ($15.80) is a new Thai-inspired yellow curry cream ppong which tastes like a combination of Japanese curry and Italian cheese baked pasta. Expect a chewier bite to the Jjolmyeon which is paired with chicken chunks and spinach leaves. The sprinkling of fried onions adds a brilliant fragrance that goes hand in hand with the umami of the melted mozzarella cheese. The dish may sound heavy and rich, but it’s not jelak at all! Cha Ppong ($15.80) is a classic seafood jjamppong that comes with 2 levels of spiciness. Although I love spicy food and can hold my spice decently well, level 1 was already sensationally fiery for me. I couldn’t get enough of the strong wok-hei flavour and the myriad of ingredients (especially the cabbage). This spicy noodle dish was really super shiok! Oh yes, it even has quail eggs! Just like the Italian pasta, the Vongole Ppong ($16.80) was chock full of seafood and packed with the lovely fragrance of garlic. 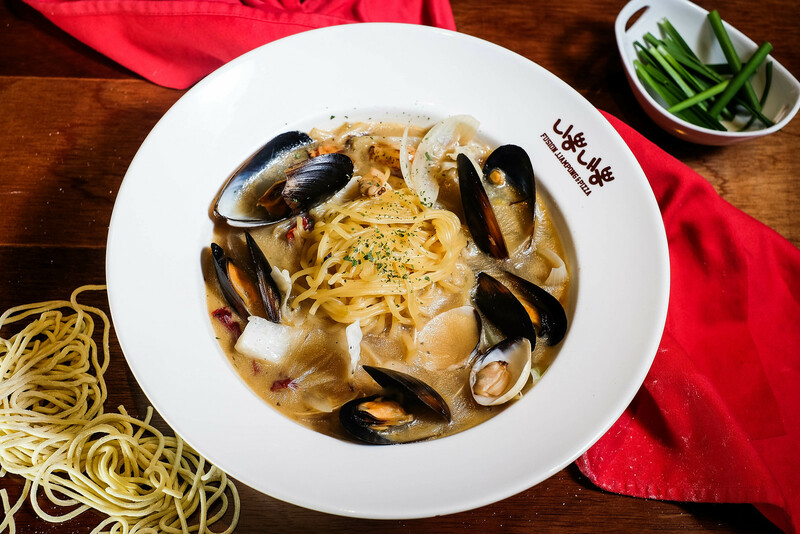 The presence of white wine accentuated the sweetness of the seafood and made the broth even tastier. Overall, this is a lighter version of “Ppong” as compared to the other options. 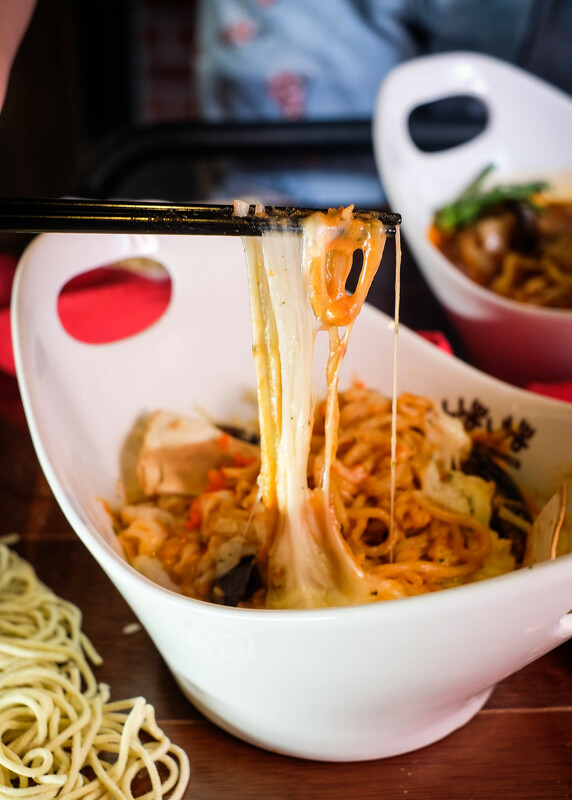 A huge contrast to the first two Ppong, the Ro Ppong-Roje ($17.80) is loaded with mozzarella cheese, and the base of the noodle dish is rich, tangy and creamy. Remember to mix the dish well so that all the noodles are coated with cheese. What a delicious combination! The Ni Pizza-Sweet Potato ($16.80) was an extremely pleasant surprise. Don’t underestimate this unassuming pizza — it’s insanely addictive! Just when I thought that the pizza slathered with sweet potato puree was a great snack on its own, I was told to pair the house-made whipped cream with the pizza which definitely took things up a notch. You might think that this sounds like a strange combination but I promise you that it will blow your mind. Unlike the typical whipped cream that comes from a spray can, Nipong Naepong’s unique whipped cream is milky and is a heavenly match with the sweet potato pizza. 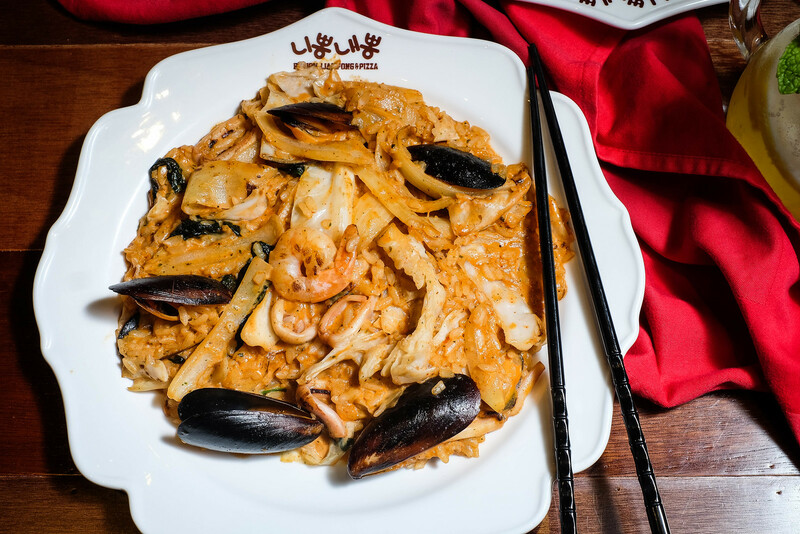 What really stood out was the prominence of wok hei in many of the dishes. 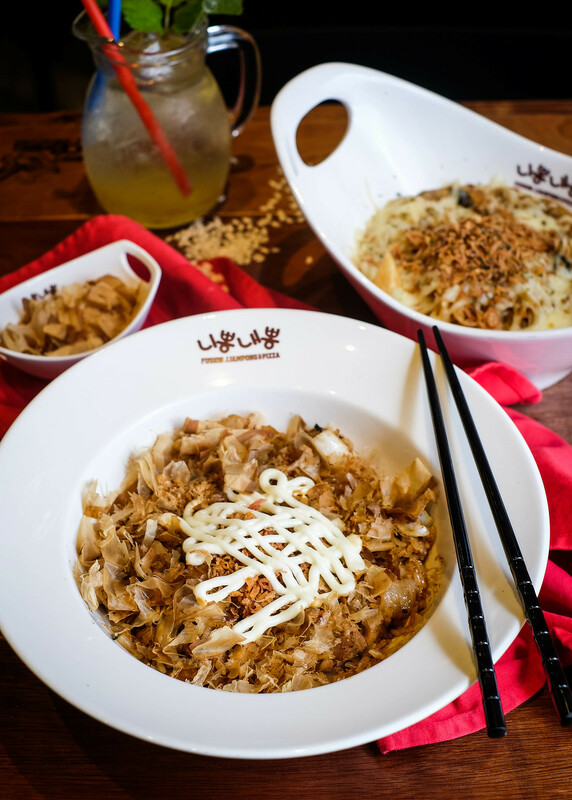 We usually only expect wok hei in Chinese cuisine but Nipong Naepong has successfully incorporated the charming smokiness into their dishes. Nipong Naepong offers pretty big portions, and they are very generous with their ingredients, especially seafood. To cater to non-seafood eaters, Nipong Naepong also has chicken and pork options instead of seafood for some of the dishes. As promised, refer to below for an exclusive deal and more information! Opening Hours: Sun to Thu, 11am-10pm (last order at 9.30pm). Fri to Sat, 11am-11pm (last order at 10.30pm). This post was brought to you by Nipong Naepong.